The concerted efforts geared towards achieving peace in the Niger Delta region, got another major boost, when Traditional rulers from Niger Delta Coastal States met with the Federal Government on Thursday, August 25, 2016 and listed six conditions, which they urged the Federal Government to meet in order to achieve and sustain peace in the region. Chief Wellington Okirika, (popularly addressed by his famous sobriquet ‘Mr 13%), who is also the Bolowei of Gbaramatu Kingdom and pioneer Chairman of the Delta State Oil Producing Areas Development Commission, DESOPADEC, read out the conditions on behalf of the traditional rulers when they visited the Minister of State for Petroleum Resources, Dr Ibe kachikwu, who represented the Federal Government. “Having acceded to the call for a ceasefire by the Minister of State for Petroleum Resources, Dr. Ibe Kachikwu, on August 4, 2016, the buck has therefore now been passed to the table of the Federal Government as driven by the Minister of State for Petroleum Resources – a representative of the Federal Government. Release the 10 innocent schoolchildren arrested by the Nigerian Army on the 28th of May, 2016 in Oporoza and others in detention on trumped up charges. 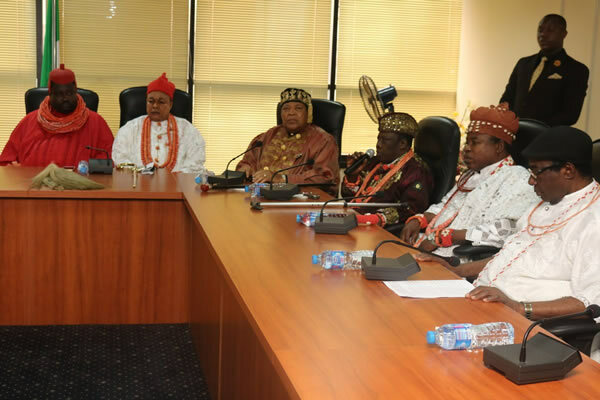 Chief Okirika then assured the Minister that the monarchs would continue to support every effort including those of the Federal Government, which would help bring peace and sanity in the region. 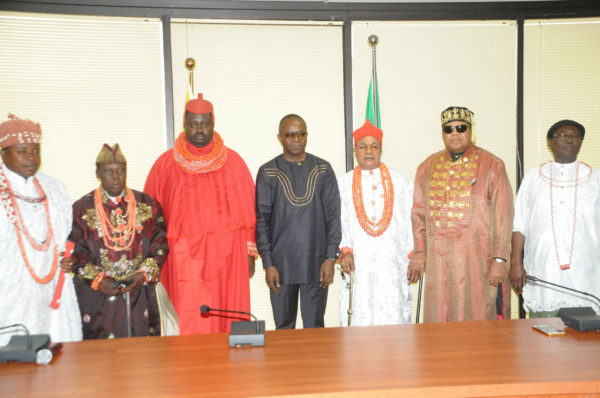 In his own remarks, the Minister of State, Petroleum Resources, Dr. Ibe Kachikwu, after having listed to the listed terms, as well as additional comments from the other traditional rulers, commended the monarchs for the visit, even as he noted that restoring peace in the region was imperative and while hailing the ceasefire announced by the Niger Delta Avengers as a welcome development, added that every effort must be made to sustain it. Kachiku however expressed some dismay with the vandalization of a pipeline in Nembe community, Bayelsa state, just after the ceasefire announcement was made, saying that the country lost about 150 barrels of oil and a high quantity of gas, by that vandalization action. “The ceasefire announcement by the NDA is very key. But what is more important is that when we say we will have a ceasefire, that ceasefire first and foremost must hold. 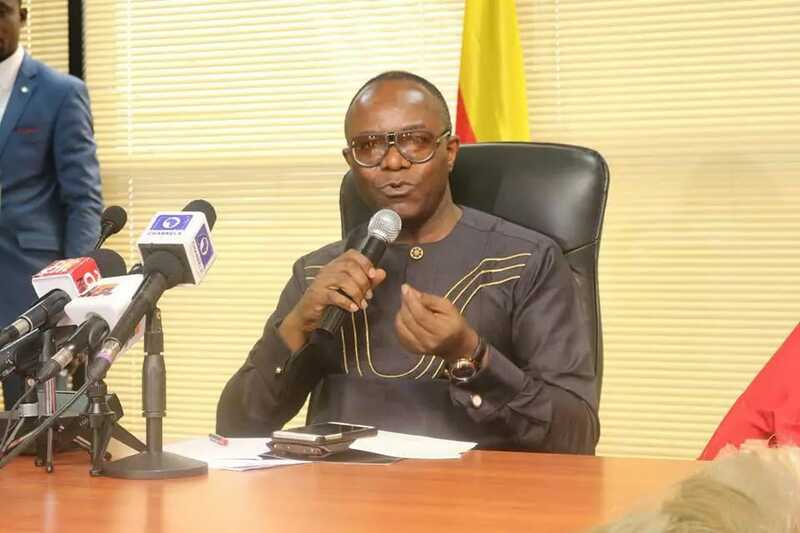 I was reminded that on Monday, which is a day after the announcement, we had an attack on Nembe Creek and we lost another 150,000 barrels and some gas in the Agip facilities. So, there are still some splinter elements who despite the ceasefire, continued to attack the efficacy of that ceasefire. “The president has shown a lot of patience and believed that engaging the communities is the best model, but it is the inability to stay steadfast on what had been resolved that usually brings in what you call the military intervention, because the reality is that no matter what we say, there is a limit to which the Federal Government will sit back and just see its assets being attacked while oil production continues to go down,” Kachiku pointed out. Addressing the Monarchs further, the Minister advised that they should work together and engage in more robust consultations in order to seek ways of ensuring total and enduring peace in the region, as oil production has reduced from 1.6 million barrel per day to 1.4 million presently, which may translate to 60 per cent down in revenue generation, as a result of the recent militants activities in the region. “You should continue to reach out to others to ensure total ceasefire because as production goes down, it affects both states in tackling the financial burdens,” he said, adding that the Federal Government had spent about 40 billion dollars in on the region in the last 10 years, but with the present harsh economic realities, there was the need for money to be applied in the proper way to ensure development, henceforth.” Kachiku said. He then charged the royal fathers and the peoples of the Niger Delta to ensure that monies were channeled in the proper way for the region, pledging that the Federal government was ready to always support a positive course for the region as it had lost 50 per cent of its revenue to drop in oil price and worsen by militants operations. “The people that pay the biggest price for militancy are the Niger Delta people. The time has come to engage in solid dialogue and everybody has a role to play. Ceasefire must stay to enable the military stop interference and we must find a positive way to solve the problem of the region. We will continue to work together as partners in progress, every step of the way until the Niger Delta Challenges are surmounted,” Kachiku assured the traditional rulers. The meeting, which was held at the NNPC Towers Headquarters, Abuja and also included the Pere of Seimbiri Kingdom, Delta state, Pere (Dr.) Charles Ayemi-Botu and the Amanyanabo of Opobo kingdom, Rivers state, Amanyanabo Dandeson Douglas Jaja V, amongst others, in its delegation of traditional rulersis, is coming in the wake of the ceasefire announced by the Niger Delta Avengers and other militant groups in the region on August 21, as well as the one-day stakeholders’ consultative meeting of Niger Delta Coastal States convened by elder statesman, Chief Edwin Clark at the PTI Conference Centre, Effurun, Delta State. Recall that Dr Kachikwu had on August 4, 2016, also commenced a consultative meeting with the Niger Delta delegation, led by His Royal Majesty, King Alfred Diette-Spiff, Amayanabo of Twon Brass and others, where the petroleum minister had requested the delegation to secure a 60-day ceasefire from the agitators. Feelers gathered from Thursday’s meeting between the traditional rulers and minister Kachiku however indicate that it was a unique forum, coming as it were, against the backdrop of the past couple of months which had been marred by protracted Niger Delta crisis as it had further restored hope and opened a channel for enabling the Federal Government to tackle the issues raised by the armed agitators in the creeks of the Niger Delta.